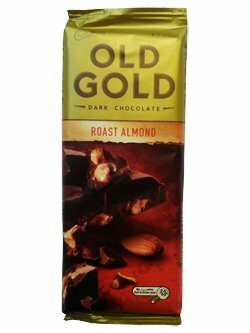 The Original taste of Cadbury Old Gold dark chocolate with delicate almond pieces. Sugar, Cocoa Mass, Almonds, Cocoa Butter, Milk Solids, Emulsifiers (Soy Lecithin E476), Flavour. Dark Chocolate contains Cocoa Solids 45%. Smooth melt-in-the-mouth dark chocolate with crunchy toasted almond pieces make this my absolute fav! So elegant and grown-up without tasting sweet. Enjoyed this nearly every day on our 3 months travelling around OZ!